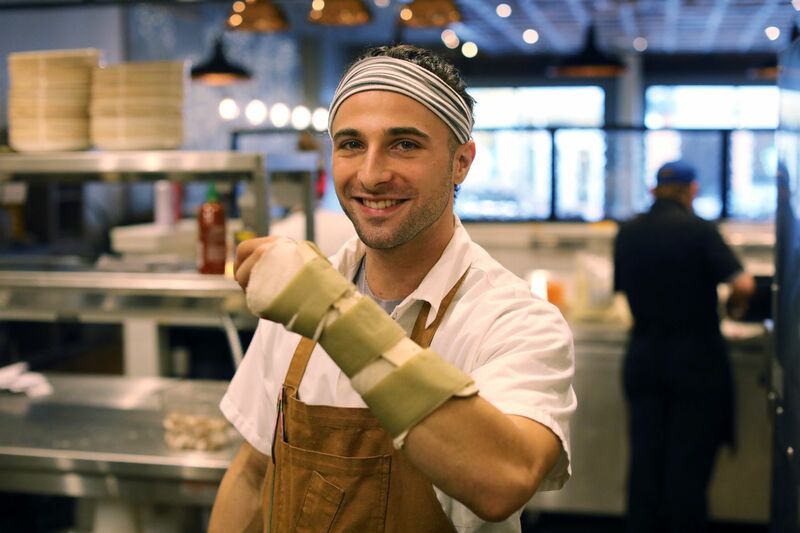 Chef Antimo DiMeo operates his new restaurant Bardea Food & Drink with one arm due to a serious injury to his left hand that happened in the kitchen in September. When he opened a cabinet and saw that a plate was falling out, Antimo DiMeo instinctively reached to catch it. “The plate broke and shattered on my hand,” said DiMeo, chef and co-owner at Bardea Food & Drink in Wilmington. At first, he was most concerned that bits of the plate might have splattered on the food he was preparing for the restaurant’s grand opening in early October. Then he looked at his left hand, which was slashed by a shard from the plate. “I could see it was a really deep cut,” he said. DiMeo, 26, got the wound stitched at a nearby emergency room and went back to work. But when his thumb still felt numb and he couldn’t move it 10 days later, DiMeo saw Stephen Liu, a Penn Medicine orthopedic surgeon. Liu discovered that the plate had cut the flexor pollicis longus tendon, which helps move and flex the thumb, and a related nerve. He had DiMeo in surgery that afternoon because, Liu said, it’s best to treat these injuries “the sooner the better,” ideally within 48 hours of the accident, to prevent scarring and stiffness. Injuries like DiMeo’s are a real hazard in restaurants and home kitchens during the holiday season, said Liu and Meredith Osterman, a surgeon at the Philadelphia Hand to Shoulder Center. Sharp knives, hot pots, garbage disposals, plates and glasses can all mean serious problems if not handled with the utmost care — which can be tough to manage under the pressure of preparing big meals for big crowds. Liu said that numbness is of particular concern because a person with a numb thumb or finger may not be able to feel a burn or injury. “We call this ‘losing protective sensation,’” he said. Nonfatal injuries and illnesses for food preparation and serving workers totaled 9,360 nationwide in 2017, according to the U.S. Bureau of Labor Statistics, and 2,010 involved hand injuries, making them the most prevalent problem among food workers, said Azure Albeck, a supervisory economist in the Philadelphia office. DiMeo is right-handed, but needs his left hand to hold anything he is cutting or stirring. About half the function in a person’s hand centers on the thumb, Liu explained. Chef Antimo DiMeo operates his new restaurant, Bardea Food & Drink, with one arm due to a serious injury to his left hand. “I can’t grip anything with my left hand,” said the chef, whose injury will take three to four months to heal, including six to eight weeks of therapy. Liu said physical therapy is as important as surgery in helping a person regain use of an injured hand. He’s optimistic for DiMeo’s recovery. DiMeo, a fourth-generation chef who has trained in Italy, said his injury was, at first, “very deflating.” Still, he says, it has made him a better leader to his staff, whom he has taught to take over some tasks while he waits for his hand to heal. “It’s slowly getting better,” he said. “If you want to work in a kitchen and be a chef, you need to love what you do,” he said. He knows the accident could have been worse. “I realize how lucky I am,” he said. Sharp knives are safer than dull ones because what’s being sliced is less likely to slip or move, which could lead to a hand being cut. Be careful when washing or rinsing dishes or utensils, and especially when handling fragile glassware you may use only during the holidays. Don’t leave them in a sink of soapy water, where an unsuspecting dishwasher might plunge in a hand and break them. The same is true for knives; clean them under a running faucet, separately from other items. Wear protective gloves and keep the kitchen floor dry to prevent falls. Concentrate on what you are doing in the kitchen. Watching TV shows, drinking alcohol, and having other people milling around can affect your focus. Make sure that garbage disposals and other equipment with spinning blades have stopped rotating — yes, the doctors have treated those accidents. And, as DiMeo can attest, don’t try to catch something that’s falling. Just get out of the way.